November in Potter County, PA is usually a sodden, grim affair, replete with blistering cold and sloppy roads. This Thanksgiving was a welcome departure from the norm. The birds seemed to be as surprised as I was, frolicking as they were about the grounds of my father-in-law’s hilltop estate. American Tree Sparrow and Eastern Bluebird are usually summer species only, but there they were right alongside the Black-capped Chickadees, American Goldfinches, Blue Jays, Mourning Doves, and Dark-eyed Juncos. I suppose that’s what happens when you fill up the bird feeder. Actually, most of the action up on the hill took place away from the feeder. The local raven got into a tussle with one of the many roving bands of crows. Golden-crowned Kinglets, Northern Cardinals, and Cedar Waxwings took advantage of the unexpected warmth to glean over territory unclaimed as yet by bitter winter. And, last but not least, a butcher bird from the boreal made an unprecedented appearance. That’s right… a Northern Shrike turned up not an hour after we arrived. Initially, I assumed it a Northern Mockingbird; the two birds share that sharp monochromatic ensemble. But when those black markings resolved into a brash bandito mask and the mockingbird’s telltale white wing patches failed to flash, I suddenly dared to dream. The bird’s heavy flight as it lumbered from telephone wire to ground and back again fed my fantasy further. But it wasn’t until Sara astutely noted that our subject’s tail, while bobbing jauntily, was not cocked at the pert angle associated with mockingbirds that I finally accepted the truth: the Core Team spotted its first Northern Shrike.Â This bird was a beauty too. It hung around for about an hour (not impaling any prey on thorns as I hoped it might) and presumably moved on, as it didn’t make any appearances after that day. Potter County didn’t offer up any other surprises, but it did yield plenty of the usual suspects. I found White-breasted Nuthatches by Ann’s feeders and Red-breasted Nuthatches in their usual stand of white pines. Alma Pond supported both Common and Hooded Merganser and Downy and Pileated Woodpecker along with Mallards, Canada Geese, and at least one mature Bald Eagle. Of course, House Finches, House Sparrows, European Starlings, and Rock Pigeons were in plentiful supply. Ruffed Grouse, on the other hand, were most certainly not, despite Seth’s best efforts to find me some. But why be greedy? Sure, Seth spotted a grouse on his way home and Will saw one just a few hours after we hit the road ourselves. That’s what makes this abundant species, elusive only to me, my nemesis. Who cares? I already had a life bird to be thankful for this holiday season. We’ve seen a few Northern Shrike around our feeders lately. A sharpshin too. We’ve probably done too good a job attracting birds to our feeders …..
Nice bird. I saw my first this weekend, too. Could it be an irruption? Butcher birds infiltrating the Mid-Atlantic make for some spectacular birding. Observed a northern shrike on our farm in Venango County yesterday (2-24-09) in a hawthorne thicket. Brauning (1992) lists no records of N. shrikes in PA. Why is that? Our recordss indicate a N. Shrike present on our farm on May 25 of 1992. Possible nesting? Mark, I have to believe that PA has seen its share of shrikes in the last few years. This one has been a big Northern Shrike year. But nesting? I think that would be peculiar even for the northernmost reaches of the state. Thanks for the reply, Mike! We could not confirm the nesting of the shrike in 1992 but saw mice hanging from a barbed wire fence on that date in addition to seeing the bird. Do shrikes exhibit this behavior (prey on thorns) all the time or only during the nesting season? You are right, we have seen northern shrikes for the past three years in our area. 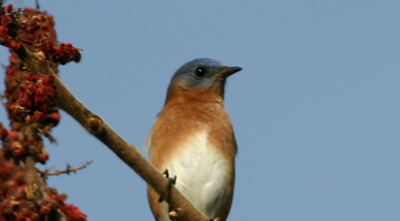 Could this mean the number of N. shrikes are increasing? What is the population status of N. shrikes overall? saw a shrike in eastern nc, in kinston. 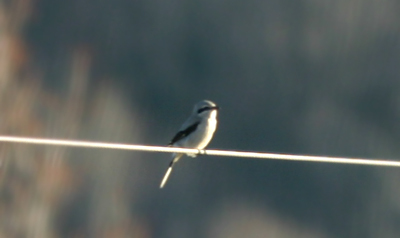 Either a northern or a loggerhead shrike. after further investigation, decided it was a northern shrike. is it possible that a northern shrike could be in this area?